As wonderful as being married is, it's also complicated and needs the support of a healthy, strong foundation. Work together on solidifying that foundation before you walk down the aisle, build skills to nurture your relationship for a lifetime with premarital counseling. The premarital package is designed to help you prepare as a couple for a solid marriage, understand your strengths, and improve your areas of growth. These sessions will be customized and catered to your relationship. The Couple’s Workbook: During the first session, you will receive a premarital couple’s workbook (from the Prepare and Enrich program) exploring various areas of relationships, tools to communicate, wedding planning tools, etc. This workbook will be used alongside the therapy process. Three Therapy Sessions: Explore relationship strengths and identify potential issues that need addressing. Strengthen communication skills to help address and prevent future conflict. Identify and manage major marriage stressors (in-laws, finances, parenting). Define the boundaries and limitations to help the marriage grow. Gain tools to resolve conflicts and understand. Learn skills to create a secure bond with one another. 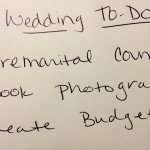 Manage the Wedding Planning Stress. Your Relationship and The Therapist: The first session is about the therapist getting to know you two as individuals and in the relationship. Exploring your comfort levels with each other while working with the counselor, and then working as a team. You will teach the counselor about your relationship; how your relationship developed, the strengths of the relationship, your concerns for the future (if any), goals for your relationship, etc. The therapist will then begin to go over the assessment results with the couple (this will continue throughout the 3 sessions). Creating a TEAM for Your Marriage and Your Future: Communication is key to a solid marriage. This session will address communication styles, patterns of communication, and ways to create a strong alliance with one another, maintaining a team, and learning how to communicate effectively as a couple. Conflict Resolution: Such as struggling with the in-law, managing finances, parenting, roles of a wife/marriage, etc. Tying the Knot: We want to make sure you are saying “I Do” feeling very confident in your relationship. You need all the tools to make this a very strong relationship. Premarital Counseling Packages San Diego can be customized to your specific needs as a couple. Some couples want only 3 sessions to prepare for their future, and other couples extend the sessions and focus more specifically on one or two items. You get to make your premarital counseling package unique and tailored to your relationship. If you are looking for premarital counseling in San Diego call us today.